How to get from playing jazz in Phase 1 to playing jazz in Phase 2 in just three weeks at 20mins a day. In Phase 1 you know all the modes of the most frequently used keys, you can play major/minor 11 v 1's in those keys without thinking. In the Phase 2 you know the same things but for all the other lesser used keys. Yes, all of them. Without exception. Now you are cooking. Practically every song you play will start in a popular key but the wicked swine who wrote it will slip in a few bars of a Gb, or a B, or E. That's when you may feel your world is falling apart. Look I have a file for this you can use in Band in A Box as a backing tape. Email me and I'll send it to you. Just change it to the key you want to practise. Load it in, arpeggio up and scale down, do it slowly. 60 beats a minute to start, after three weeks you'll get to 180 bpm Do it in your familiar keys first then use it in the others you don't know. Slow I said, and I meant it. 20 minutes a day and you'll have it cracked in three weeks. 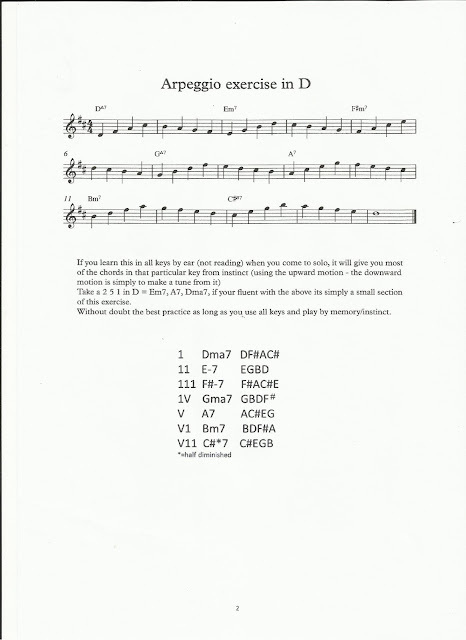 This arpeggio and scale exercise was given to us in the Jazz Smugglers workshop kindly by Steve Turner and copied into BIAB by Geoff Valenti. Thanks lads. Very useful. Would you SHARE this with your musician friends please. Everyone teaches the cycle of 5ths. But no one, in my experience, has taught the implications. For example, C is the 5th up from F. There is only one note different in the scale. Bb becomes B. And that is true of all the modes in both of those scales. (You can use B in the F major scale because that is the Lydian major note). So if you see a change of this kind don't worry too much about the change note although for musicality purposes the chord tones are different. But if you go up or down a minor third then the game changes a lot. Go up to Eb from C and you have 3 notes different. Go down a minor third to A and you have 4 notes different. That's a tricky change - one to worry about. This video is of Alan Barnes leading a local group of youngsters. Last night Alan Barnes played with Terry Seabrook organ, and Alex Eberhardt kit, at the Snowdrop in l.ewes. How it is that we can hear the country's leading alto player for free in a small out of the way pub on a Monday I shall never understand. It really was a lesson in beautiful, clear, accessible jazz playing from all three of them. He played Lazybones, the Hoagy Carmichael song, with a languid feel which never strayed far from the feeling of a hot Summer's day by the river. Then he played "Have you Met Miss Jones?" the lovely up tempo song to which they gave a happy feel. It is that kind of song. He seemed to me always to find the mood or the style of a song and capture it. He very occasionally touched on the melody, but often seemed to follow the shape of the song. So in the interval I asked him about what he felt when he was playing. He said that for him the melody and the rhythm were the most important factors. "Harmony is a poor third" he added. I asked him about the patterns he played. He said he prefers to think of them as "shapes". He teaches players to use them, and to repeat them inside and outside. He said he is not against the use of riffs, although they seem to have gone out of fashion. For me personally the song is the thing, and I fully accept that this view is not shared by others. Players I like are always those who feel their way through the song. I don't want all of them to be songs that I know and recognise, but some of them should be otherwise I lose interest. When I know a song, I can feel involved when the soloist takes it away and brings it back. It may be old fashioned, but if you ran a musical concert advertising that all the songs are original compositions then you'll get a lot of people there who are are musicians. But if you ran a programme of brilliant jazz musicians playing songs we know, then you'll get a much much bigger crowd. n this blog We will produce tips for jazz piano, and jazz guitar together with jazz saxophone. We will cover jazz chords, jazz guitar chords, and we will deal with jazz scales. We will cover jazz songs. This site is all about jazz improvisation.